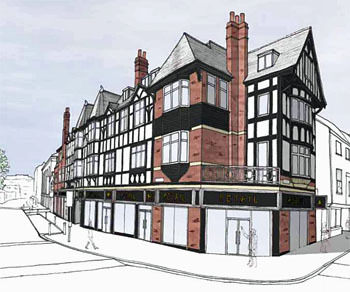 A planning application has been submitted for the redevelopment of the White Swan, Piccadilly, York’s most complained about “eyesore”. The plans involve converting the hotel into apartments while retaining the shops on the ground floor and the familiar street frontage. The hotel was built in 1912. It may be a coincidence that plans for its redevelopment have been submitted in its centenary year, but they have been widely welcomed, as this building has been closed up and empty for around 30 of those 100 years. Indeed it has been empty and sad-looking for so long and its redevelopment has been so long awaited that even a sketch scribbled on the back of an envelope might have had a good chance of immediate approval. All the more admirable then that this application seems to have been so carefully prepared. It’s an interesting read, including historical background, all nicely presented. I went to the exhibition on the plans back in July, when they were put on public display at the Friends’ Meeting House in York. A lot of effort had gone into it – it wasn’t just a load of display boards in an empty room. There were people keen to answer questions, and a questionnaire for us to complete, if we wished. I went away feeling cheerful. Mainly because the owners of the building had responded to the opinion voiced by many York citizens that they like the facade as it is, and didn’t want it demolished and replacing. The suggested redevelopment, as the drawing they’ve submitted shows, leaves it as before, but much smarter. The planning application documents include a report of the feedback from the exhibition, and details of how the public consultation was organised. It included a large mailing to nearby residents and businesses, a notice in The Press, an article in The Press. The mailing went to around 5,000 people and the article must have reached many more people. 36 people attended the exhibition apparently. The number includes councillors and press. Not many, is it? Perhaps everyone was sufficiently reassured by the information provided before the exhibition, that the building’s exterior was to be preserved, and felt no need for further details. Its windows still show painted symbols from its brief spell as the ‘Rainbow Peace Hotel’. The instruction ‘DO NOT OPEN’ is painted on a window at the top. Presumably referring only to the window, not the entire building. Its 30 years of closure remain a mystery. Its renovation and reopening will be a relief to many. These include a Design and Access Statement, a Historic Building Report (includes some interesting old photographs) and the Statement of Community Involvement Report. White Swan Hotel, Piccadilly – written last year. 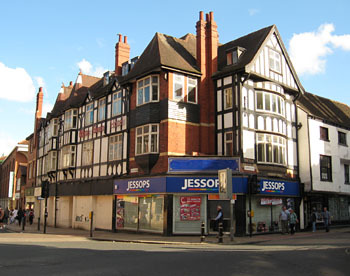 And there’s also an update on the building (new planning application, in 2013).